Originally created this when I was putting together Babalon Babes issue 4. Otherwise known as the Astrology issue, I drew this around mid-late 2009. After watching news footage of Japan, I remembered this piece. So I’ve posted this up in honor of that country. I’ll explain. Do you see the twin girls in the front of the illustration? They were known as The Shobijin. The Shobijin could be described as deities, priestesses or faeries who would call to Mothra with either song or prayer. 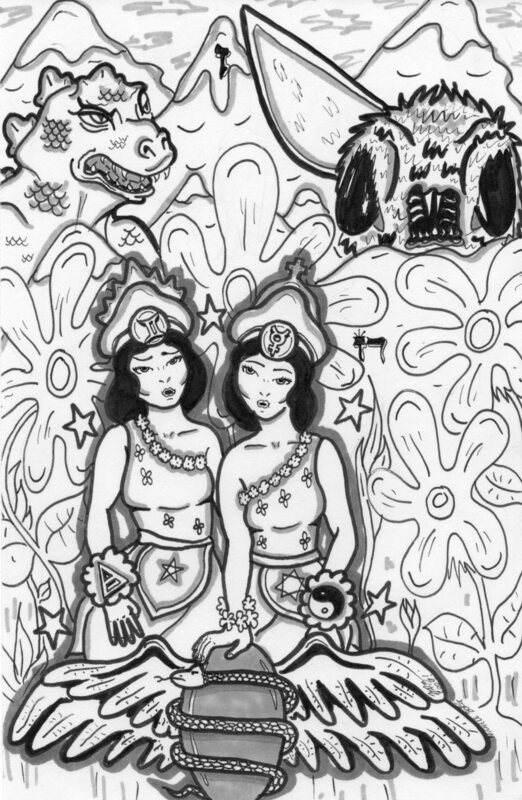 The twin imagery also corresponds to the Gemini sign. The twins is the symbol for Gemini, and it’s element is air. The twins shown here communicate to Mothra with words and song. Air signs deal with communication. As for Mothra and Godzilla…sometimes they are allies, sometimes they are in conflict with each other. A contradiction of sorts, which can describe Geminis a bit. In March 2011, I recalled doing this piece. Seeing Japan with the tsunami effects and the nuclear crisis, figured I would post this. It’s not only my tribute to the Japanese monster movie genre, but to Japan as a whole.